April 13, 2017 – Version 0.9.3 released. 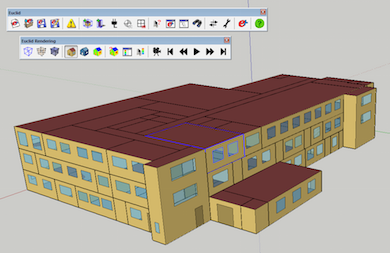 Euclid is a free and open-source extension for SketchUp that makes it easy to create and modify the geometry inputs for building energy models. Euclid builds on the Legacy OpenStudio extension originally developed by the National Renewable Energy Laboratory (NREL). Because NREL no longer supports Legacy OpenStudio, Big Ladder Software has taken over maintenance, development, and support of the extension–now renamed as Euclid. Just like its precursor, Euclid will continue to support reading and writing of EnergyPlus geometry in its native IDF format, but will also add new features and capabilities to read and write other energy model formats. Going forward we have awesome plans to add significant new functionality to make the extension an even more useful tool for energy modelers. If you haven’t installed a SketchUp extension from an .rbz file before, you can find instructions here. See the repository for more information on installation, compatibility, and usage. For the time being, Euclid is still sufficiently similar to the Legacy OpenStudio extension that you can refer to the Legacy OpenStudio User Guide for documentation and tutorials. You can open the guide from inside SketchUp. Updated for compatibility with SketchUp 2016 and 2017 (SU 2015 may also work). Fixed bug where duplicate zones and surfaces were being created. And other miscellaneous bug fixes. One caveat on the update for EnergyPlus 8.6: The Daylighting:Controls object has changed in 8.6 and is not yet handled correctly. We expect to have a fix for this in the next version. In the meantime the Daylighting:Controls tool and rendering has been temporarily disabled. Any daylighting sensors in your existing models will not be displayed, nor will they be deleted or modified. Euclid is derived from the open-source Legacy OpenStudio extension originally developed by the National Renewable Energy Laboratory. The California Energy Commission provided funding to update the extension and develop support for other energy model formats.